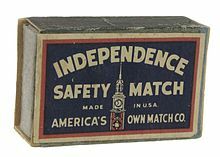 For other uses, see Made in USA (disambiguation). The Made in USA mark is a country of origin label that indicates the product is "all or virtually all" made in the United States. The label is regulated by the Federal Trade Commission (FTC). In general, goods imported into the United States must have a country of origin label unless excepted, but goods manufactured in the United States can be sold with no "Made in the USA" label unless explicitly required. U.S.-made goods that must bear an origin label include automobiles, textiles, wool, and fur products. Any voluntary claims about the amount of U.S. content in other products must comply with the FTC's Made in USA policy. A Made in USA claim can be expressed (for example, "American-made") or implied. In identifying implied claims, the Commission focuses on the overall impression of the advertising, label, or promotional material. Depending on the context, U.S. symbols or geographic references (for example, U.S. flags, outlines of U.S. maps, or references to U.S. locations of headquarters or factories) may convey a claim of U.S. origin either by themselves or in conjunction with other phrases or images. It will not be considered a deceptive practice for a marketer to make an unqualified U.S. origin claim if, at the time it makes the claim, the marketer possesses and relies upon competent and reliable evidence that: (1) U.S. manufacturing costs constitute 75% of the manufacturing costs for the product; and (2) the product was last substantially transformed in the United States. However, this was just a proposal and never became part of the final guidelines published in the Federal Register in 1997. On July 4, 2013 House Representative Steve Israel announced legislation that would require all U.S. national parks to sell merchandise that is Made in the USA. A product that includes foreign components may be called "Assembled in USA" without qualification when its principal assembly takes place in the U.S. and the assembly is substantial. For the "assembly" claim to be valid, the product's "last substantial transformation" also should have occurred in the U.S.. A "screwdriver" assembly in the U.S. of foreign components into a final product at the end of the manufacturing process does not usually qualify for the "Assembled in USA" claim. Country of origin labels are required on textiles, wools, furs, automobiles, most foods, and many other imports. Examples of fraudulent practices involving imports include removing a required foreign origin label before the product is even delivered to the ultimate purchaser (with or without the improper substitution of a Made in USA label) and failing to label a product with the required country of origin. A rumour spread that products made in a town named "Usa" located in Ōita Prefecture, Japan and exported to the U.S. in the 1960s carried the label MADE IN USA, JAPAN, to create the appearance that the product was made in the U.S.. It is, however, a myth that Japan renamed the town "Usa" following World War II so that goods exported from Japan could be labeled as such. The town has existed from the 8th century (see Usa Jingū), predating the existence of the "United States of America" (first used in the 1776 United States Declaration of Independence) by more than a millennium, and is not a major manufacturing center; furthermore, the United States Customs Service would likely have recognized such labeling, had it occurred, as fraudulent and thus would have prohibited goods so labeled from being imported into the United States. Many manufacturers use the Made in the U.S.A. label as a selling point with varying degrees of success. This tag is associated with marketing and operational benefits, such as more appeal to certain buyers and lower shipping costs. When an American consumer sees a product is made in the U.S., they ought to perceive this as higher quality than a Chinese-made version. The decision where to produce is based on many factors, not simply direct product costs. Marketing and operations are both affected greatly by producing domestically. Many companies highlight the fact a product is made in the U.S. with their branding and marketing campaigns, benefitting from the huge marketing potential, often affecting the success of a product. Country of origin is a typical heuristic used when purchasing, playing a significant role in consumer perception and evaluation since some consumers believe domestic products offer higher value and less risk. For years American car brands have used this as a differentiating point. 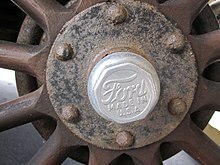 Supporting companies such as Ford was thought of as patriotic. Twenty-eight percent of Americans have said they would only buy American vehicles. There was a large push from domestic automakers after foreign competition entered the market in the 1980s. Ford placed ads to all Americans highlighting that they made quality cars. Chrysler also needed to reclaim market share from foreign competitors. They created commercials about American cars that were made by Americans with American parts. In recent years, the trend has changed as Cars.com' 2016 American-Made Index for that year showed that many Hondas and Toyotas are among the top "American-made" automobiles. 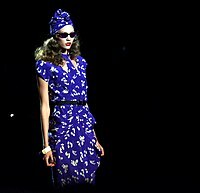 Karlie Kloss showcases an Anna Sui dress at New York Fashion Week, Sui's collections have been designed and manufactured in New York's Garment Center since 1981. Some may be concerned with the exploitation of non-American workers in sweatshops. Therefore, a product bearing a Made in the USA label can appeal to an American who seeks high-quality products produced domestically under American labor and environmental laws. Until it shut down in 2017, American Apparel, which had been producing in Los Angeles since 1989, was the largest clothing manufacturer in North America. They were committed to social responsibility, and offered their factory workers careers with benefits and pay significantly higher than that of their overseas counterparts. After worker protests and bribery investigations, Walmart, the largest grocery store in the world, has pledged to source $50 billion in products from the US over the next ten years. Companies such as Tropicana sold their orange juice as being 100% native to Florida. In the late 2000s decade, they started to mix oranges from Brazil, and Florida's Natural saw this as an opportunity to place "Made in the USA" on their cartons. After Tropicana returned to only using Florida oranges several years later, Florida's Natural updated their ads saying "All Florida. Never imported. Who can say that?" Companies that make products in the USA also see benefits in their supply chain. Not all benefits are directly seen in cash flows immediately. Aspects like communication are simply improved, which may have effects that are not seen in the short run. The trend towards overseas factories has resulted in complications for companies of all sizes, ranging from quality to timeline issues. Some direct costs are decreased as a result of using domestic factories. Shipping is simpler and faster when there is no need to deal with customs. US factories offer more flexible production runs, which can be appealing to new companies or new products. These offer prices and quantities closer to what companies require. Research shows that reduced tariff rates are reflected immediately in lower clothing prices. This suggests that the price of an imported good directly includes the tariff paid to import it. By producing in the US, this price increase is avoided. Companies also benefit from non-direct cost ways of making in the USA. The USA has the most productive workforce. Costs are higher for these factories but the workers are more effective than their abroad counterparts. China historically was a cheap place to manufacture. This led to the thriving apparel factories. As currency appreciates, and wages rise people are moving to low-cost areas in south-east Asia, and also coming back to the USA. China's prices are rising and time to market is becoming increasingly important. Communication is difficult as well for companies that produce in areas where another language is spoken. The general manager of a Haier plant in Camden, South Carolina Bernie Tymkiw has been quoted saying, “We just don't have the brainstorming ability because of language.” The cultural disconnect can prove to be a significant barrier with global companies. Supply chains are agiler using local suppliers. There is a greater control over orders. High-end designers like being very close to their factories, as they have full control of the product quality that is leaving the assembly line. This is necessary to keep their high standards. One can visit their factory as often as necessary. This plays an important role in auditing the production process. An online article about the luxury apparel maker company Everlane led to over 2,000 shirts sales in a single day. A shirt restock from China may have taken three months, whereas they were able to do it in under one month. Being closer to the factory can aid in shipping costs and time. The FTC has a page summarizing this issue, but, as of late 2011, there appears to be no "bright line" determining what "all or substantially all" means. Examples are given on the FTC site; a barbecue grill made of components made in USA with the exception of the knobs may be called "Made in USA" while a garden tool with an imported motor may not. Goods produced in American Samoa (a United States territory) are entitled to attach a "Made in USA" label, as this is an insular area of the United States. This area has until recently had few of the labor and safety protections afforded United States workers, and there have been a number of cases of sweatshop operators exploiting labor forces imported from South and East Asia. The Northern Mariana Islands is another U.S. possession in the Pacific that was exempted from certain U.S. wage and immigration laws until 2007, where the use of the "Made in USA" label was likewise controversial. The label is controversial also since all U.S. insular areas, except Puerto Rico, operate under a customs territory separate from the U.S., making their products technically imports when sold in the United States proper. In June 2016, the Federal Trade Commission ordered Shinola Detroit to stop using "Where American is Made" as a slogan as "100% of the cost of materials used to make certain watches is attributable to imported materials." Today, the Ronda movements are made in Bangkok, Thailand. The dials, hands, cases, crystals, and buckles are manufactured in Guangdong, China. ^ a b c Levinson, Marc (May 5, 2017). The Meaning of "Made in U.S.A." (PDF). Washington, DC: Congressional Research Service. Retrieved 24 October 2017. ^ "Examples Of Applications". Ftc.gov. 2011-06-24. Retrieved 2012-10-23. ^ "Document" (PDF). Retrieved 2012-10-23. ^ "Made in USA". snopes.com. 2011-07-08. Retrieved 2012-10-23. ^ Miller, Daniel (2016-10-28). "Detroit Automakers: The Truth About American-Made Vehicles -- The Motley Fool". The Motley Fool. Retrieved 2016-10-28. ^ "History: 1980s". Adage. September 15, 2003. Retrieved November 28, 2016. ^ Sottek, T. C. (2014-09-19). "Car commercials from the 1980s were completely insane". The Verge. Retrieved 2016-11-28. ^ "About Us". store.americanapparel.net. Retrieved 2016-10-26. ^ "Made in USA makes comeback as a marketing tool". USA TODAY. Retrieved 2016-10-26. ^ Elliott, Stuart (2012-02-15). "Made-in-America Resonates With Marketers". The New York Times. ISSN 0362-4331. Retrieved 2016-10-26. ^ a b Rowan L. Made in America, maybe: The potential renaissance of domestic apparel manufacturing in the united states. Georgetown University; 2015. ^ Zigmantavičienė, A., & Snieška, V. (2006). Methods of measurement of non-tariff barriers in the international textile trade. Engineering Economics, 46(1), 13-19. ^ Flannery, R. (2014). Cambodia factory shootings underscore shifts, openings in the global apparel business. forbes.com, 3. ^ "Made in the USA Workshop". Ftc.gov. 2007-06-25. Retrieved 2012-10-23. ^ Office, U.S. Government Accountability (2017-05-18). "Commonwealth of the Northern Mariana Islands: Implementation of Federal Minimum Wage and Immigration Laws" (GAO-17–437). ^ "U.S. Immigration Law in the Commonwealth of the Northern Mariana Islands (CNMI)". USCIS. Retrieved 2018-10-16. Wikimedia Commons has media related to Text:Made in USA.